Today we’ll be taking a look at Columbia River’s Kangee T-Hawk. With a unique take on the axe and pick design, this forceful tool is multi-faceted and powerful. This tactical weapon, designed by Ryan Johnson of RMJ Tactical, offers something most tomahawks don’t: a 3-sided blade. The Kangee T-Hawk is constructed from one piece of SK5 forged carbon steel and is finished with a black powder coating to help resist rust and scratches. The curved handle is built from glass-reinforced nylon and is lined with grip coils for easy handling. Overall Weight: 1 lb. 8.4 oz. 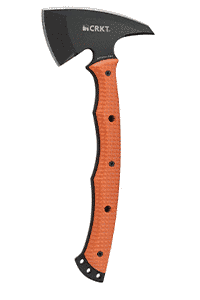 The most distinct feature on this tomahawk is the tapered cutting edge on top. This edge can also be very dangerous, so be careful. A form-fitting black Kydex sheath is included that firmly fits and buckles over the head and sports a Molle clip fastener that can be attached to a vest or similar equipment. It also offers an adjustable shoulder strap if you’d rather carry it that way. This best thing about this tool is that it is tough; I mean it is virtually unbreakable! The steel itself is made of ultra resistant SK5 Carbon Steel with a hardness rating of 54-55 HRC. 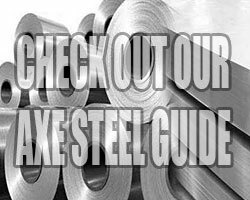 This type of steel is considered to be very high quality. With the addition of the black powder coating which offers increased resistance to scuffs and scratches and razor sharp edges that offer scrupulous precision control, this steel is pretty impressive for a tactical tomahawk. The curved full tang design and grips along the handle can give you easy handling and support you through a number of tasks, ranging from simple to tough and difficult while the finger grooves and strategic contours ensure a secure grip. You can use this tool for chopping, splitting, throwing, shaving, hacking and so much more. 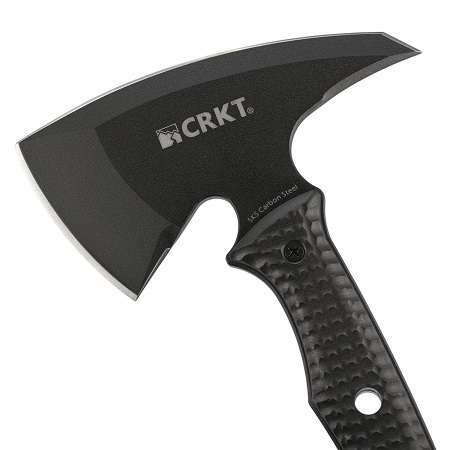 The CRKT Kangee T-Hawk will tear down anything in its path. 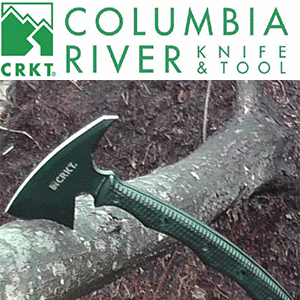 Designer Ryan Johnson of RMJ Tactical in Chattanooga, TN has been skillfully producing innovative tactical tomahawk designs for over 30 years and with CRKT producing the illustrious Kangee T-Hawk, you can get an extraordinary tool at an affordable price. A three-sided, armored, highly resistant carbon steel blade with an aggressive spike end and precise, razor sharp edges, makes this tool one of the best you can buy. The T-Hawk is assertive enough to be used by police and military teams, but practical enough to be in an average workman’s garage. It can be employed in everything from average outdoor work, survival needs, throwing for sport, breaching or extraction, and everything in between. The grip on the handle can be easily removed for cleaning and the sheath offers a secure way to cover and protect the blade for carry or storage. With a hardness rating of 54-55 HRC and SK5 carbon steel, this blade will bite through cardboard, wood, and even aluminum. This is a must have for any person interested in the best tactical tools. I've owned this axe for over a year now and it's a great allround axe. I always bring it when going camping, it fits nicely in my backback and when my knife isn't enough it's great to have this axe with me.